Professor Braham's The Politics of Genocide, is the most comprehensive and meticulously researched book in the literature of the Holocaust in general and Hungary in particular. The Politics of Genocide: The Holocaust in Hungary, Condensed Edition is an abbreviated version of the classic work first published in 1981 and revised and expanded in 1994. It includes a new historical overview, and retains and sharpens its focus on the persecution of the Jews. Through a meticulous use of Hungarian and many other sources, the book explains in a rational and empirical context the historical, political, communal, and socioeconomic factors that contributed to the unfolding of this tragedy at a time when the leaders of the world, including the national and Jewish leaders of Hungary, were already familiar with the secrets of Auschwitz. The Politics of Genocide is the most eloquent and comprehensive study ever produced of the Holocaust in Hungary. In this condensed edition, Randolph L. Braham includes the most important revisions of the 1994 second edition as well as new material published since then. Scholars of Holocaust, Slavic, and East-Central European studies will find this volume indispensable. Randolph L. Braham is distinguished professor emeritus of political science at the City College and the Graduate School and University Center of the City University of New York, where he serves as a director of the Rosenthal Institute for Holocaust Studies. He is the author of co-editor of forty-two books, including The Nazis’ Last Victims: The Holocaust in Hungary (Wayne State University Press, 1998). His two-volume The Politics of Genocide: The Holocaust in Hungary (Columbia University Press, 1981) was selected for the National Jewish Book Award in 1981. Wayne State University Press and the United States Holocaust Memorial Museum have done students of the Holocaust and of modern Eastern-Central Europe a great service by releasing a condensed edition of Randolph Braham's classic study...The Politics of Genocide will remain the exhaustive and comprehensive point of reference for all future investigation into the history of the Holocaust in Hungary. Readers interested in an introduction to the many issues involved can do no better than to begin with this revised edition. This is a book that should be read and understood by the widest possible readership Clearly, it belongs on the shelves of serious Holocaust scholars and should also find an important niche in college level courses on the Holocaust and/or Jewish History . . . magnificent work. – Dr. Abraham J. Edelheit, Dr. Abraham J. Edelheit is an assistant professor of History at Kingsborough Community College of the City University of New York. 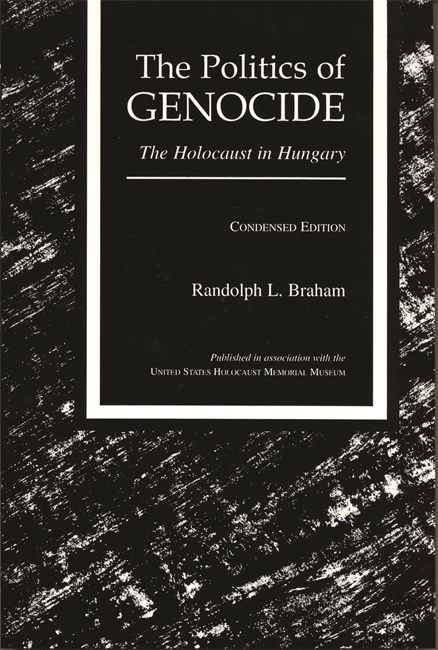 Professor Braham's The Politics of Genocide, is the most comprehensive and meticulously researched book in the literature of the Holocaust in general and Hungary in particular. . . . the standard and unsurpassed account of the destruction of Hungarian Jewry. [T]his book will bring the history of the Holocaust in Hungary to a wide range of readers: scholars, teachers, undergraduates and graduate students. It is an abridgment of a monumental work and the remainder presents itself as a simply smaller monument." The earlier majestic editions of The Politics of Genocide provided the English-speaking public with vivid and accurate information on European Jewry's ultimate tragedy, the Holocaust in Hungary, which took place lass than a year before the end of World War II. The book's Hungarian version caused a nation-wide re-thinking of the role Hungarians had played in that event. This abbreviated version should be read by students, scholars, and all those concerned with genocide at any time and in any country."